It was great to be back at Art in the Park again this year where we created a map of Leek with children and their families participating in drop in workshops on the 21st and 22nd May in Brough Park. The finished map will be displayed in the Foxlowe Arts Centre in Leek. Thanks to Friend's of Brough Park for having us on board again. Erik worked with Leek based mental health support charity Borderland Voices to produce an animated short âWorlds Apartâ. 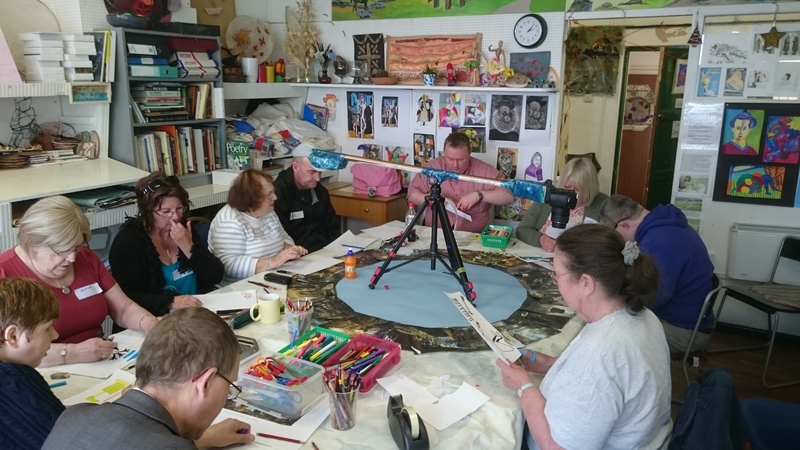 The project involved 2, 2 hour sessions working with BV members exploring the theme of a post apocalyptic world using, photographic collage, drawing and stop frame animation. 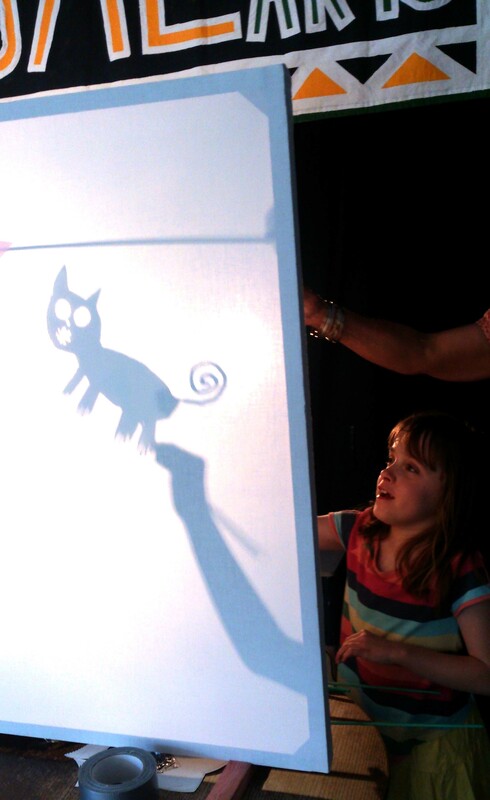 We spent a lovely day at the Foxlowe Arts Centre in Leek, Staffs on Sunday 5th June delivering a shadow puppet making workshop as part of the annual volunteerâs day celebrations. Thanks to the Foxlowe for having us on board and all the people who took part! 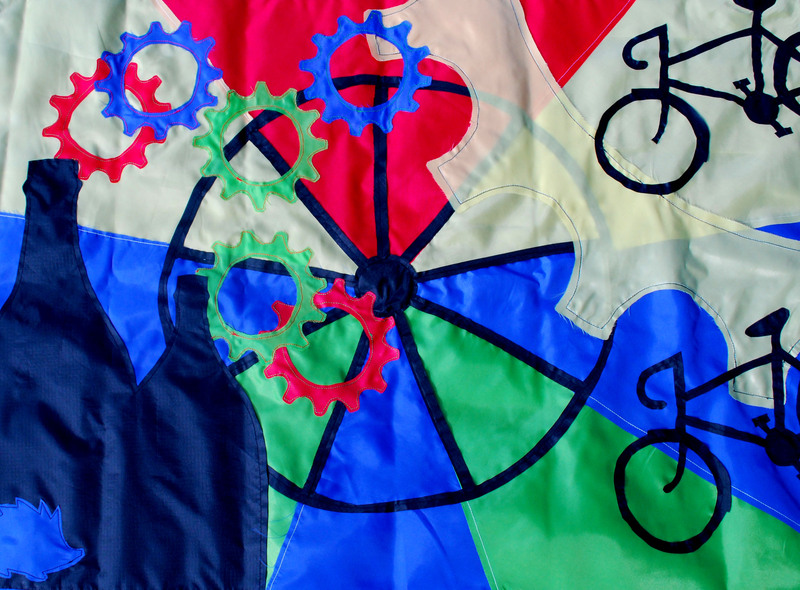 Cathie was excited to be commissioned again this year to make a starter flag for the Stoke-on-Trent leg of the Tour Series, the annual series of cycling criterium races which started in 2009. This year she worked with children at the Donna Louise Hospice in Trentham. 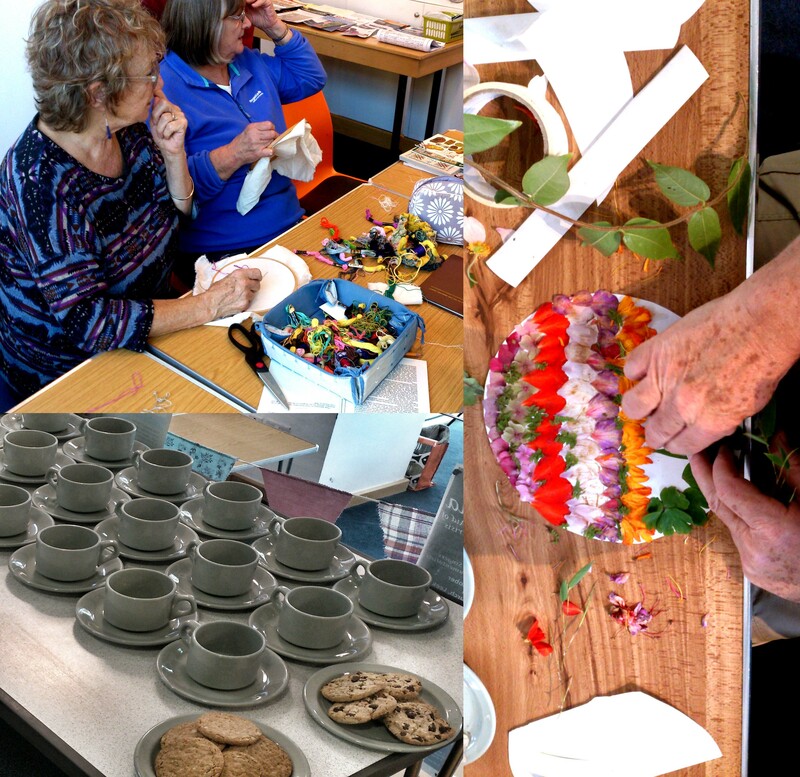 As part of Food Fest 16 Cathie delivered a food themed bunting making workshop at the Lymelight Festival. Activities included sewing, veg printing and painting with natural dyes. 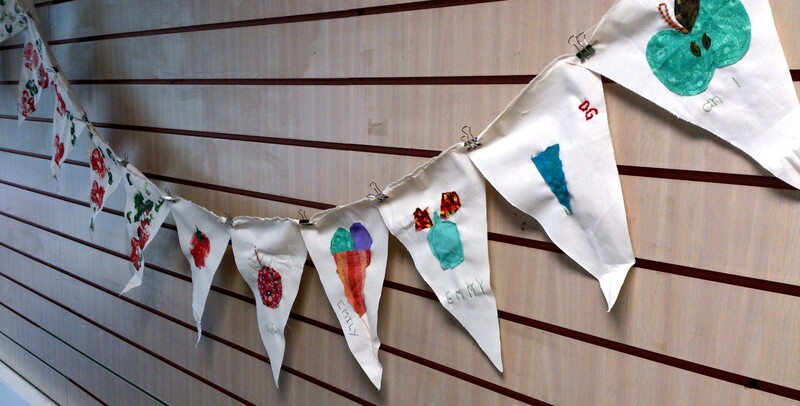 The finished bunting will be displayed at upcoming Food Fest 16 events around north Staffordshire. 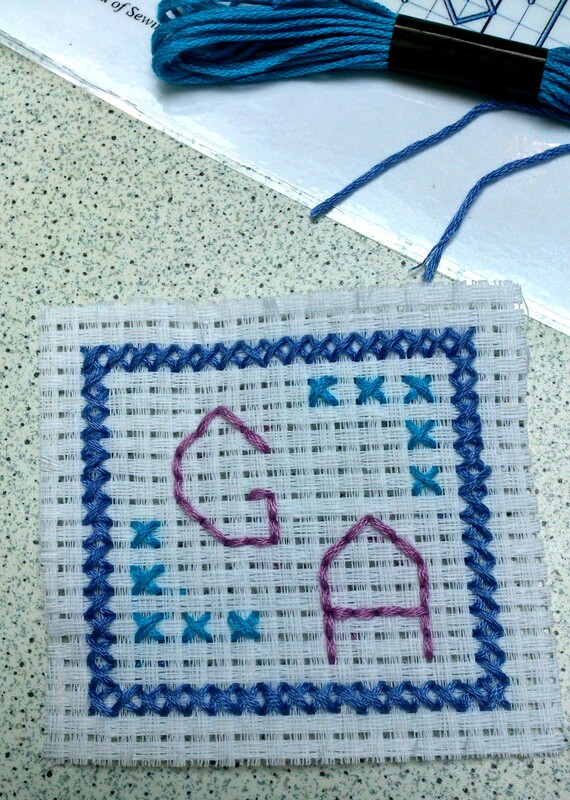 A great day spent teaching Victorian style mini cross stitch samplers as part of Gladstoneâs Staffordshire Day open event. Great to see so many children and families interested in sewing and the largest turnout Gladstone has ever seen Iâm told, despite the challenging weather! Cathie has just completed a successful 4 weeksâ worth of water themed workshops at Borderland Voices in Leek. 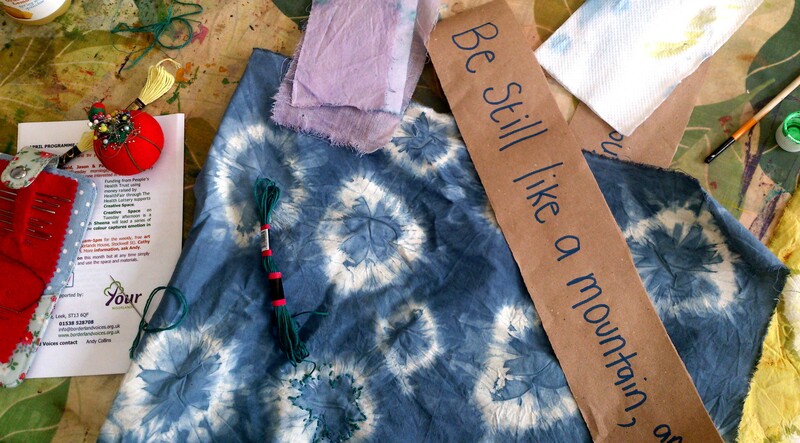 The workshops included drawing, tie dying, silk painting and painting with natural dyes and embroidery. Thank you to all at BVâs for being such enthusiastic and friendly participants! We are immensely proud to share the news that our very own Viv Young has been presented a Highly Commended Award in the category of Dignity in Creativity at this yearâs Dignity in Care Awards. Nominated by Andy Collins of Borderland Voices for her continued work with people with mental health issues and dementia. âStaffordshireâs Dignity in Care awards recognise care services that respect an individualâs dignity, ensuring they are treated with respect, they can freely express their needs and wants, and they can maintain the maximum level of independence, choice and control. A total of 13 awards were presented to individuals and organisations who put peopleâs dignity at the heart of everything they doâ. Well done Viv, totally deserved and so nice to see all the great work you do recognised. We just wanted to take the opportunity to share a couple of photos from last weekâs Live Age Festival. Viv and Cathie had a great day at Trinity Church in Leek delivering workshops in Narrative Arts and Embroidery. Both workshops were well attended and well received with participants not only getting involved in creating some beautiful work but also keen to learn and take part in more sessions. Massive thanks to everyone who has been involved in getting Live Age 2015 off the ground and also to Leek Arts Forum for funding towards our workshops. Cathie and Viv will be running workshops at the Trinity Church, Derby Street, Leek. ST13 5AB on the 1st October. The completed flag was used to mark the start of the 6th stage of the Tour of Britain today in Hanley, Stoke-on-Trent. The flag will then be displayed at the children's ward at the Royal University Hospital, Newcastle under Lyme alongside the children's original artwork and photographs. This week Cathie has been delivering Tour of Britain flag making workshops in the children's ward at the Royal University Hospital in Newcastle-under-Lyme commissioned by Stoke-on-Trent City Council. 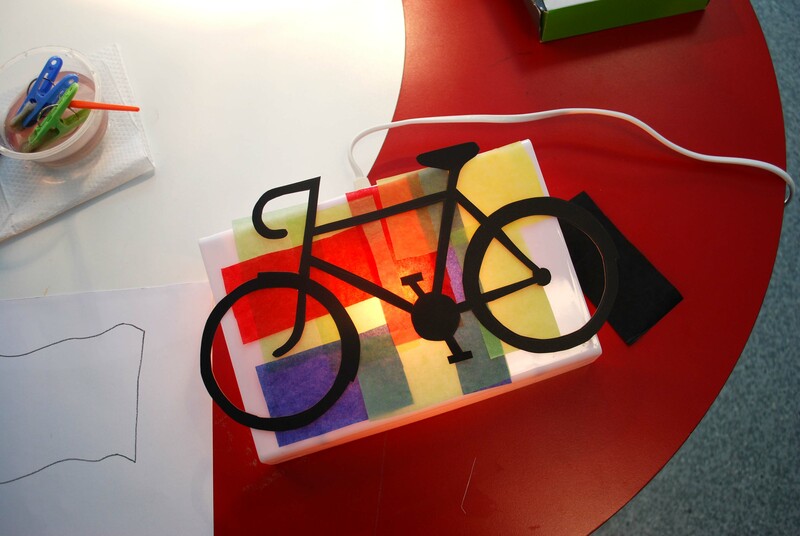 Children have been helping with the design process using light, colour and Stokie themed imagery. The completed flag will be used to open the 6th Stage of the tour in Hanley on 11th September. We are really excited to announce that the Art in the Park âWhat makes you happy?â wall hanging is now displayed in the Cruso Room at the Foxlowe Arts Centre, Leek. Big thanks again to everyone who helped to make it. We spent a great weekend in Brough Park in Leek, Staffordshire running a banner making workshop on behalf of Borderland Voices at this yearâs Art in the Park. 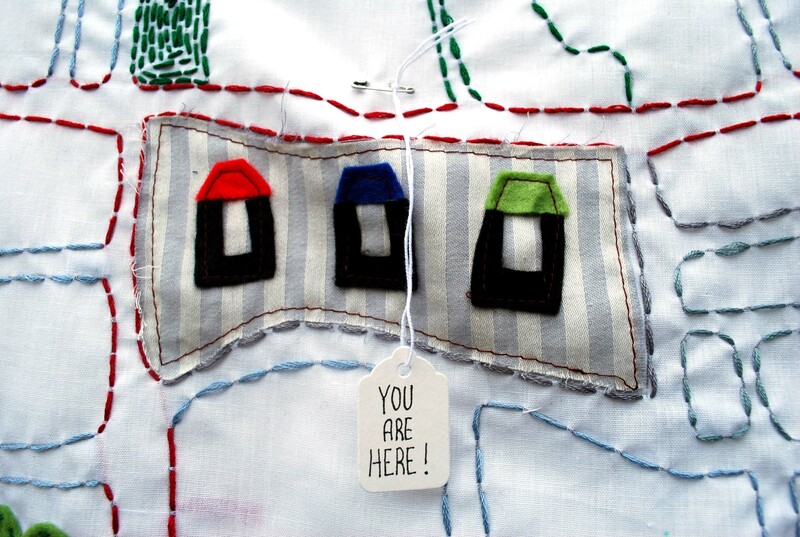 Participants were invited to make a textile square based on the theme âwhat makes you happy?â using a mixture of machine and hand sewing, drawing, applique and potato printing. The finished squares will be stitched together to make a wall hanging which will be displayed in the Foxlowe Arts Centre in Leek. Cathie has been commissioned by the Mitchell Arts Centre to be their âArtist in Residenceâ at New Ford Primary School in Stoke-on-Trent. She worked with over 300 pupils from Reception, Nursery and years 1, 2 and 4. Using the schoolâs book week project as inspiration Cathie delivered workshops in Bug Home building, banner making, scrap booking and also made a giant beanstalk! Central to the workshops was the importance of friendship, recognising and championing talents and teamwork. The work produced will be displayed at the school as part of their end of school year celebrations. We are really pleased to announce that Cathie Powell-Davies our UK Residency local artist has teamed up with Staffordshire Universitiesâ Janet Hetherington to secure funding to continue working at St Quentinâs Residential home. âArt on the Timetableâ is an exciting new project funded by Staffordshire County Council which will be led by Cathie and will take the form of a series of workshops. The workshop sessions will be held at St Quentinâs residential home and aim to explore further some of the themes and ideas touched upon during Residency. The workshop programme will be purposely designed to fit into the activity structure which is used within the home as part of the daily routine. The workshops will specifically be designed for older people with complex needs, many of who may require nursing care. The workshops will develop the ideas and themes about community building within care settings which were initiated during Residency. 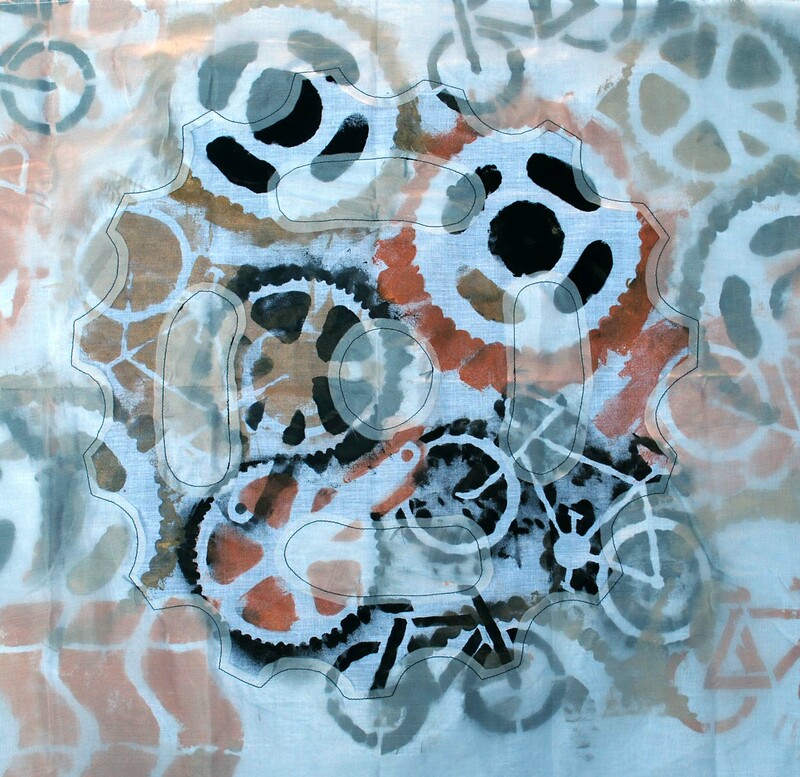 The intention is to create a menu of opportunities including textiles, costume design, sculpture and Fine Art. Cathieâs prior experience in the setting ensures these will be designed and based around the needs of the residents. Accompanying the workshops will be a programme to engage staff in discussion about how St Quentinâs team can develop skills to initiate arts projects and embed arts practice into their existing activity programme. 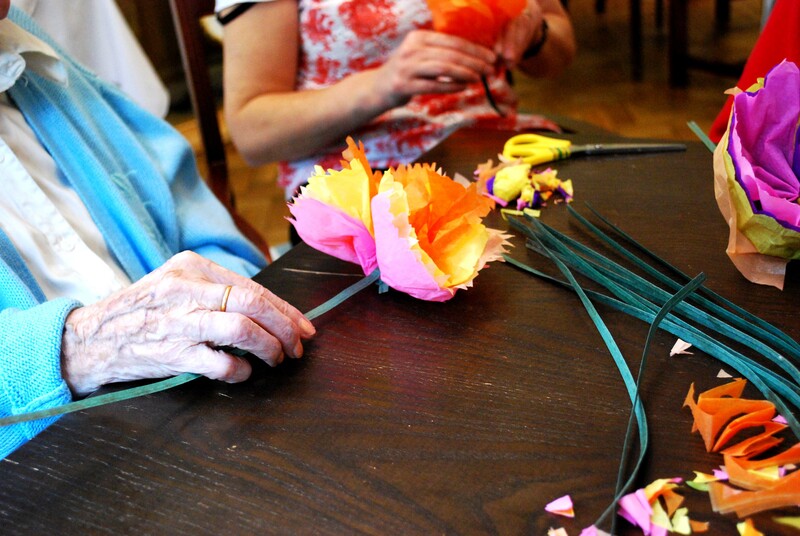 The overall project aim is that care staff will learn and develop new skills and approaches that will enable them to continue to offer a high quality of creative sessions with residents which will challenge and exceed standard expectations of what can be offered in a care home setting long after the project has finished. Great afternoon in the sun making felt at Cheadle's Rethink HQ. Rethink is a charity who provide support and advice for people and their families living with mental health problems. Cathie returned to Sandford Hill this week, this time to work with year 2. Working with the whole year group over two days she delivered sessions in weaving and felt-making to produce some artwork for a school notice board with a garden theme. Our final week was dominated by setting up the âMe, Us, Communityâ exhibition in the universityâs Uniqube gallery. Alongside this, the U.K. Residency Team hosted a study week trip and welcomed visitors from Poland and Spain as well as local artists. We enjoyed a personalised Soup Kitchen evening hosted by AirSpace Gallery in Hanley and were given the opportunity to present the exhibition and our work from the last eight weeks to fellow artists and academics from The University of Barcelona, University of Warsaw and Staffordshire University. Itâs been a great opportunity to put our project into context alongside the rest of the residencies which will be taking place over the next twelve months as well as meeting like-minded creatives from across Europe. Our exhibition opening proved to be a great success. There was a good turnout including four of our St Quentinâs participants. However, the real success for me was the opportunity that we were given to gather St Quentinâs participants in the residential building to show photographs from the exhibition and play the audio tracks. This brought home to me again the importance of communication which has proved to be so central to the whole project. Bringing the nursing and residential staff together was great because it stimulated conversation and residents made some personal connections which they had hitherto been unaware of. Me, Us, Community has been a real journey, intense, challenging, exciting and a lot of fun! The last thing I wanted was to deliver a project where we parachuted in and out leaving no legacy. I truly hope that this has not been the case. I have been told post project that St Quentinâs Saturday art class has been met with great enthusiasm especially from one resident who had always been a reserved and reluctant participant but was keen to join in with Christmas decoration making, whilst another played the piano. Iâd like to think that some of this could be our influence but perhaps itâs too early to say. My final thought is that this is just the beginning. We have learnt so much and it feels like we have raised more questions than we have answered. I really hope that we can find a way to keep the conversation going. Cathie is pleased to report that she is now into week 3 of her residency with Staffordshire University working alongside Spanish Photographer Almudena Caso as part of a wider university research project âUK Residencyâ exploring civic engagement. She will be working in two care home settings over the next couple of months on what looks to be an exciting and challenging project. âIâm thrilled to be part of the UK Residency Project. It marks the beginning of a new chapter for me as I embark on a career as a fully self-employed artist. Not only is it exciting for me personally but it is already shaping up to be an interesting and rewarding project which will benefit a wide spectrum of peopleâ. A celebration of creativity in later life! Viv and Cathie ran workshops around Communication through Art in Residential Care and Traditional Patchwork at the Life Age Festival on the 1st and 2nd October at the Potteries Museum and Arts Gallery in Hanley, Stoke-on-Trent. The Live Age Festival showcased the work and talents of local older people and arts organisations across Stoke-on-Trent and North Staffordshire. The festival was initiated by Keele and Staffordshire universities, together with a range of partners, cultural institutions, arts-based groups and other organisations. On Wednesday I attended âArts Outsideâ, the second major event for the West Midlands Participatory Arts Forum. Since âDirection of Travelâ over two years ago I have attended as many WMPAF meetings as I have been able to and thought it might be helpful to share my thoughts on what it means to me and what it can offer other artists working in the public realm as there still seems to be some confusion. · It does not currently receive any funding. (Events and meetings have relied on small one off grants, pulling favours and good will). · There is no hierarchy. Unlike other forums, council initiatives or Arts Council funded organizations, no one is in charge. Anyone who is interested is welcome to attend meetings and decisions tend to be made by whoever was there on the day. · An informal âcommitteeâ of core members has evolved as regular faces have chosen to attend meetings; this is by no means an exclusive group. · It does not expect anything of its members; no one is expected to volunteer their time unless they want to. · WMPAF is a collective of artists, arts workers and other professionals who share a common interest in creativity which involves a participatory element. · Its purpose is to provide networking opportunities, putting people in touch with one another in order to share ideas, knowledge and experience. Safety in numbers. · Membership is open to all and does not involve any fees or official paperwork. Just turn up, join the mailing list and get involved! I have personally found WMPAF to be extremely useful. I understand that it is fairly unique in that it is supported by both Staffordshire County Council Arts Development and Staffordshire University Creative Communities Unit, not because they are contractually obliged to to fulfil some kind or remit but because of key individuals and their genuine passion for participatory arts. As a freelancer in an increasingly tough field it is all too easy to feel isolated and disheartened. An event like âArts Outsideâ is a breath of fresh air. I am not alone; I am not wasting my time, I am part of a huge legacy and growing network of talented, intelligent, passionate and above all tenacious people. So if youâre still not sure if WMPAF is for you, why not just come to the next meeting or event and find out? Chances are you wonât regret it! Viv has been delivering ongoing work with residents at Wall Hill Care Home in Leek which has resulted in a series of artworks, some of which have been printed onto greetings cards that also display a photograph on the back of the artist/resident at work. The visual arts activity not only provides residents with a social outlet and creative opportunities on a weekly basis but in making a photographic record of their artwork the creative skill of each person is validated, their individuality is celebrated and the artwork is reflected back to the artist. Storytelling and exchange of memories forms a natural part of the activity. The greetings cards are currently being sold within the care home to raise funds for the purchase of in-house art materials. The objective being to empower residents to draw or paint at any time they wish. 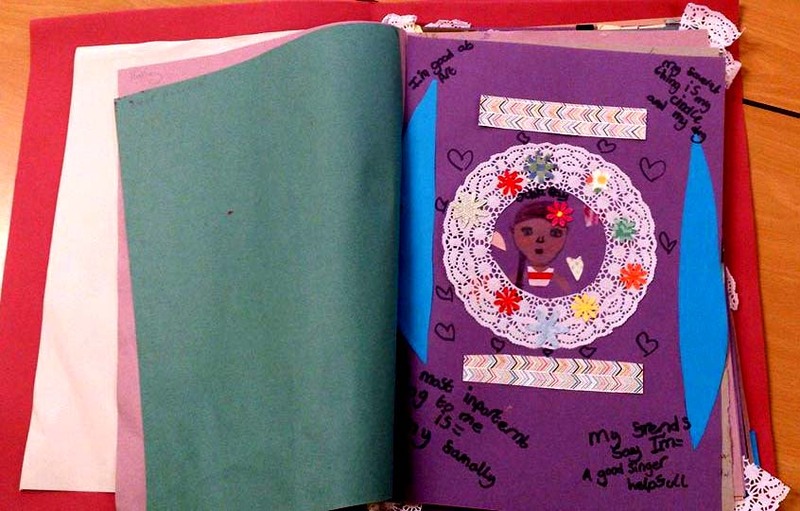 âThe sessions are Art Sessions not Craft - the group take it quite seriously and love to see their cards (especially the images of themselves on the back - evidence showing them producing the artwork!) The drawing materials are all professional quality and there is a variety so that people can choose what they prefer to use. I try to set up beautiful still-life arrangements that stimulate interest - the model sailing boat was a favourite and scented flowers always create interest. Items like shells, a stone Buddha, and animal or butterfly pictures trigger stories. One participant joins in just to chat and sometimes she'll stitch or browse through a nature book. Several people have related tales of their childhood on farms and adventures in the local countrysideâ. We were thrilled to be invited back to the rather marvelous CoCoMAD festival in Cotteridge, Birmingham for another year of fun in the sun. This year saw us offering Bug Home making, leaf printing and microscopy workshops alongside some boss beats from our good friend Barry and his interactive drum structure. The predicted rain stayed away and we had another busy and hugely successful year. See you next time guys! Cathie returned to Birches Head Academy in Stoke to deliver two days of carnival costume making for primary school children looking to move up to the high school in September. A series of Brazilian themed activities were on offer including Portuguese lessons, Capoeira and Samba drumming. During Cathieâs workshops she taught pupils about the spectacle that is the Rio de Janeiro carnival and showed them how to make their own headdresses. Team Hullabaloo returned to Somerset for another great year on Kidz Field! This yearâs theme-less theme saw participants creating an array of colourful characters from our âscrap pileâ and bring them to life in a series of weird and wonderful animated shorts. Vegetarian vampires, trespassing cows, dinosaurs in space and a love story with robots are just a few of the stars in #myglastostory. Each dayâs creations can be found on www.kidzfield.com watch this space for the final fully edited feature length film! Cathie worked with Year 4 pupils to produce a giant jigsaw on the theme of My School Community. Starting with a brain storming session pupils were asked to think about their favourite lessons, school clubs, friends, family and what the wider community meant to them. They then designed and produced individual jigsaw pieces using a mixture of drawing, collage and mosaic techniques. Pupils also wove a paper river Trent which incorporates sentences explaining the elements of their community that mean the most to them. The jigsaw is framed with a tree and a bottle kiln representing Longton Park and the Gladstone Museum which contain words such as pride, happiness and protected to express how pupils feel about school life at Sandford Hill. The finished work is displayed in the schoolâs entrance hall. Cathie returned to Leek based health & wellbeing charity Borderland Voices this month to deliver the first of three drawing workshops. A whole range of techniques and medium will be covered and the sessions look set to produce an exciting and highly skilful body of work. We spent a fun evening with the K2 Explorer Scout Unit in Stafford creating a series of exciting images using torches and sparklers. 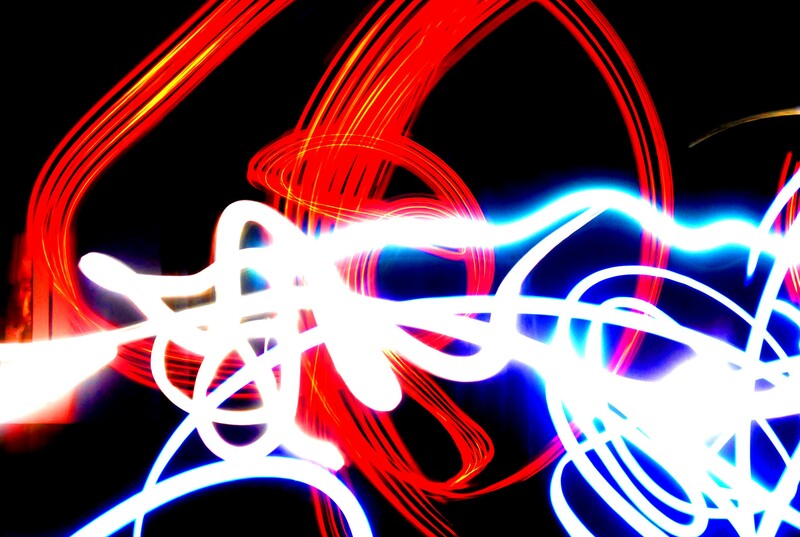 This method known as Light Drawing involves using a long exposure setting in a darkened room or outside at night. We will also be putting together a short animation from footage collected which will be on our youtube channel soon. Cathie & Viv are delivering Christmas Craft drop in workshops at Longton Market on 14th and 21st Dec. Free to anyone who fancies making some unique Christmas decorations, Cathie got the ball rolling today with tree decorations using scraps of wrapping paper and festive bunting. Viv continues the up-cycling theme next Sat between 10am and 2pm. Cathie spent two days in Blurton Primary School, Stoke-on-Trent at the end of November working with pupils from all 6 year groups to produce 12 banners as part of the school's 'Super Stoke' project. The project aimed to celebrate all things Stokie and to instill pupils with a sense of pride in their heritage. The banners (which will be displayed in the school hall) depicted images based on the children's drawings on themes such as Josiah Wedgewood and the potteries, Stanley Matthews and Stoke City FC, Reginald Mitchel, canals and Lidice. Farewell to the (current) Hullabaloo bus! Today we had the priviledge of some wonderful company for a Mad-Hatter style tea party at Central Forest Park, Hanley. The event was held to commemorate the end of the road for our lovely bus which has served us well for the past three years. Now, sadly, it must make way for a newer model. The sun was shining despite a brisk November chill and tea and cake was enjoyed by all. A photoshoot captured the memories and giant Jenga provided some thrills and spills. Just touching base for long enough to report that our summer festival Space Exploration tour is, well totally out of this world! So far we've built rockets, flying saucers, jet packs, masks and shadow puppets at Glastonbury, Standon Calling and Wilderness. This weekend promises more fun and frolics as we head for sunny Cheshire and Just So then a short breather before we tighten up our Kuiper belts and head for far flung Lincolnshire and the Alchemy Festival in Sep.
Cathie worked with pupils from Blessed Mother Teresa's Catholic Primary School in Stafford on 12th July 2013 to produce two mosaic tile friezes which mark the retirement this summer of the school's headteacher Mrs. Phillips. The friezes were based on designs by year 5 pupils and depict images which commemorate Mrs. Phillips' time at the school including the garden and pet chickens which she introduced and a strong link she made with a twin school in Calcutta. After a few minor hiccups the tiles are now fired, glazed and ready for a second fire prior to starting the task of installation this weekend! Pre-sessions completed, Kibblestone Scout Camp here we come! With all the pre-sessions now completed we are geared up for making 300+ tiles tomorrow at Kibblestone Scout Camp. Let's hope the rain leaves us alone! Cathie & Erik will be working alongside leaders and members of 21st Hartshill Scout group over the next few months to produce approximately 300 earthenware tiles. The tiles will adorn the recently installed fire pit and barbeque area which commemorates the 100th anniversary of 21st Hartshill. The project kicks off with an introduction to clay modelling techniques using air dry clay, the explorer scout unit, Minton heritage and did someone mention Tolkien? Thanks to Cultural Sister's Deb Rogers for her lovely company and photograph (above). Hullabaloo Arts provided an opportunity for attendees of the Get Together South Staffordshire event to revisit their childhood with a quick fabric printing activity using potatoes. The Live and Local networking event included a celebration of the summer's local community achievements, a talk about funding options and a mesmerising performance of brass and keys from Orichalcum. The event provided great networking opportunities and we got to meet and talk with a range of interesting people, some of whom we hope to work in partnership with in the future. Winner of the quick quilt workshop raffle to be announced soon! Cathie and Erik enjoyed a fabulous afternoon in Cheadle with The Cultural Sisters at their Pugin glass workshop. The process of using various tools and ingedients to create unique, personalised glass coasters with inspiration drawn from Augustus Welby Northmore Pugin was both fascinating and highly enjoyable. Thanks to Deb, Fiona and Mel for their hospitality. Can't wait to see the final results! Last weekend we joined the creationists at Burslem Park for Adoration Festival 2012. A beautiful sunny day did little to keep people from showing up with their picnic blankets, footballs and liquid refreshments. Clearly, dancing and rejoicing was the order of the day. A fabulous day in a wonderful park. If you haven't been yet, what are you waiting for? A fine time was had by all who attended today's 'Parklive' event at Hanley Park. The music trail saw acoustic acts jamming in various locations around the park whilst delicious Caribbean food was served from the Uni-Q tent adjacent to the bandstand. We enjoyed the afternoon's entertainment which was enhanced by some lovely March sunshine. Well done to Staffs Uni Creative Communities Unit for putting Hanley Park back on the map! Cathie and Erik attended the WMPAF conference at Bantock House, Wolverhampton and had a fabulous and rewarding experience, mingling with like minded people who, like us, are dedicated to keeping participatory art alive and pushing it forward to the next level. The forum was both inspiring and thought provoking and the activities were very enjoyable.